For the home match this Saturday against Stranraer, Rovers will be once again teaming up with Cancer Research UK to promote the upcoming Race For Life event, held in the Beveridge Park on the weekend of 15th and 16th June. Rovers are proud to be partnering with the Cancer Research UK events team for what is a significant event in the Kirkcaldy calendar. This year, Race for Life have opened the event up to everyone, meaning, Dads, brothers, sons, uncles and grandpas can join in the Race for Life 5k, 10k or Pretty Muddy events alongside women to raise even more money for Cancer Research UK. To mark our support for the event, Rovers team will warm up in Race for Life t-shirts beforehand, and Rovers fans will also have the chance to find out more about Race for Life and how to sign up that afternoon. We will have a special cross bar challenge at half time where some lucky players will have a chance to win free Race for Life places. Rovers fans are also invited to pick an inspirational song to feature on our playlist which is a Race For Life theme. Saturday June 15: Pretty Muddy Kids and Pretty Muddy 5k, Beveridge Park, Kirkcaldy. 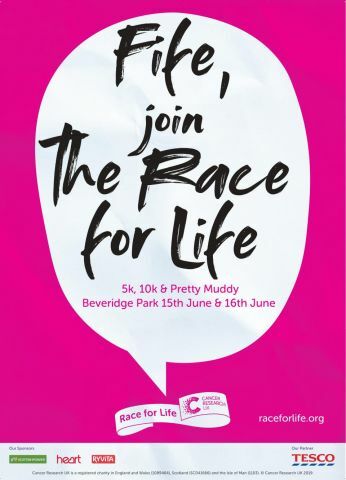 Sunday June 16: Race for Life 5K, Race for Life 10K, Beveridge Park, Kirkcaldy. As mentioned above, We are looking for inspirational tracks for this week’s Stark’s Park playlist. Email your suggestions to playlistraithrovers.net by noon on Thursday or add to our facebook page.